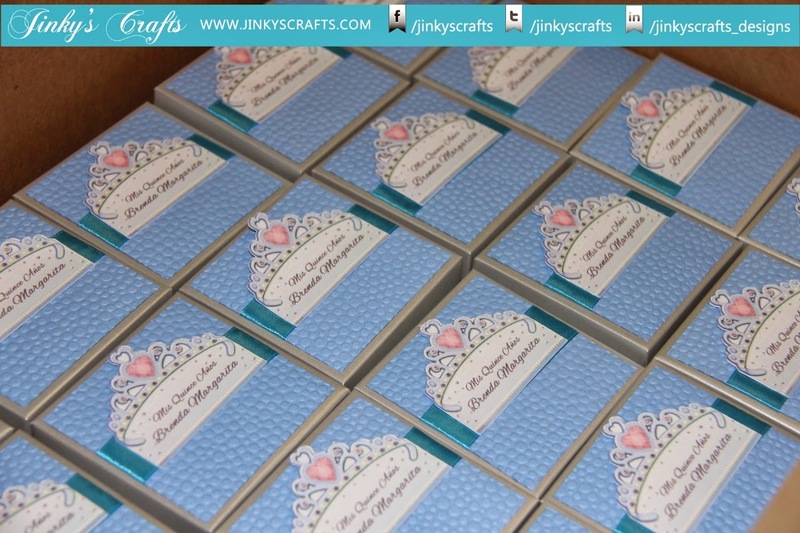 Jinky's Crafts Exploding Box Wedding Invitation in Pink and Grey color scheme are handcrafted in our own unique way. They're elegantly decorated with miniature doves and cut-outs. This Wedding Box Invitation is extra ordinary. When opened, the box explodes and reveals 4 special panels where the Wedding Wording is written. The top panel bears the main Wedding Wording Invitation. The left panel is where the Church information and the right panel is the RSVP information. The Bottom Panel is the custom wedding calendar graphics. The Lid Cover of this Elegant Wedding Box Invitation is layered with luxury designer paper and embellished with satin ribbon with a custom Wedding Tag Label. Very simple yet elegant. The 3-Tier Paper Cake is used as a centerpiece and is luxuriously decorated with cascading miniature flowers with grey satin ribbon cake trimming. A custom cut-out wedding initial monogram of the Bride and Groom serves as the cake topper. It's so unique and beautiful. I love the final results of these invites. The size of this Exploding Box is a 3.5 x 3.5 inches cube. 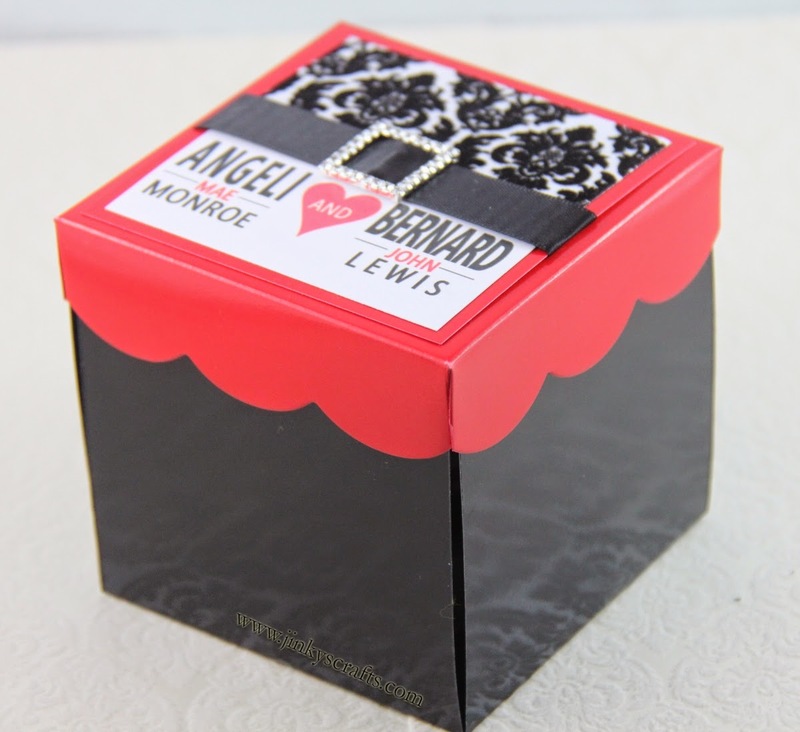 It can also be used as a Wedding Placecard, Gift Favor, or Gift Box. These can also be used as Sweet Sixteen Invitations, Quinceanera , or Bat Mitzvah Custom Invitations. 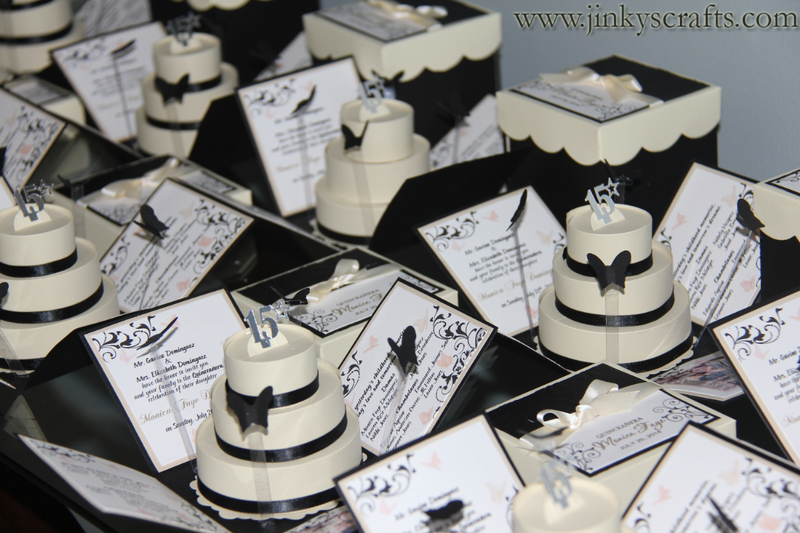 Cream and Black Invitations are so elegant. It is simple, clean and classy. 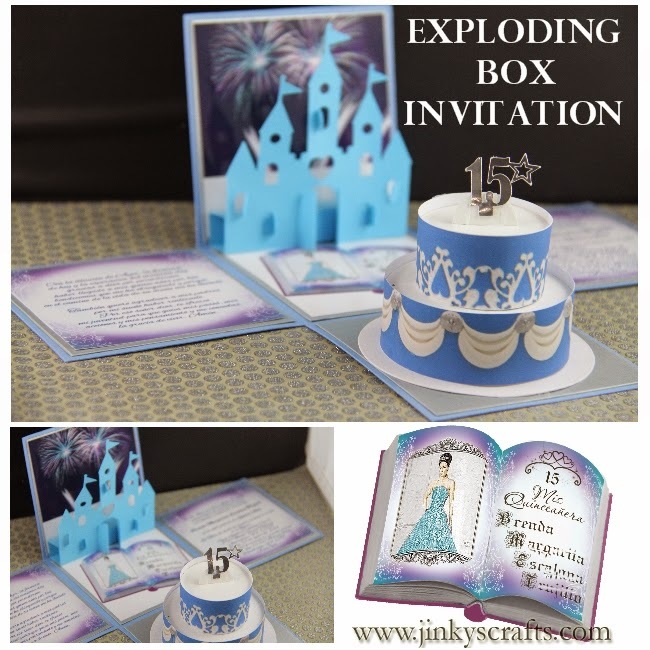 This Mis Quinceanera Exploding Box Invitations are Fully-Customizable. 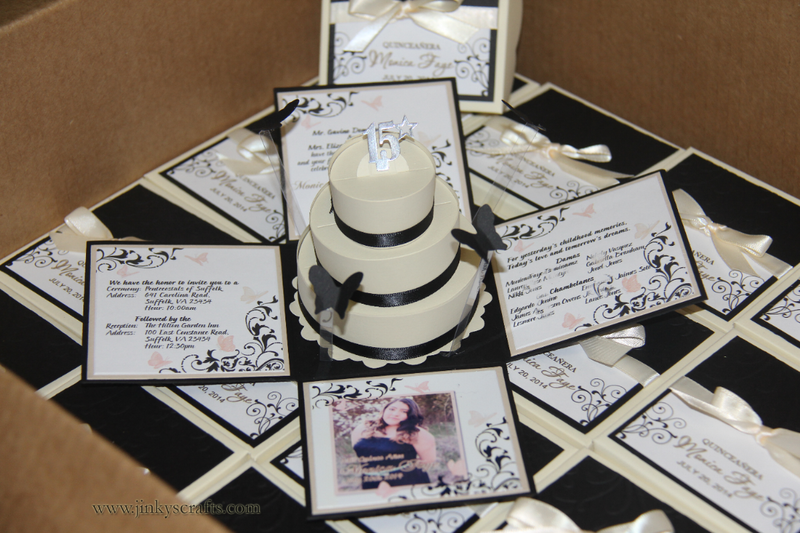 If you are thinking of having a unique or out-of-the-box invitations for your Super Mis Quince. 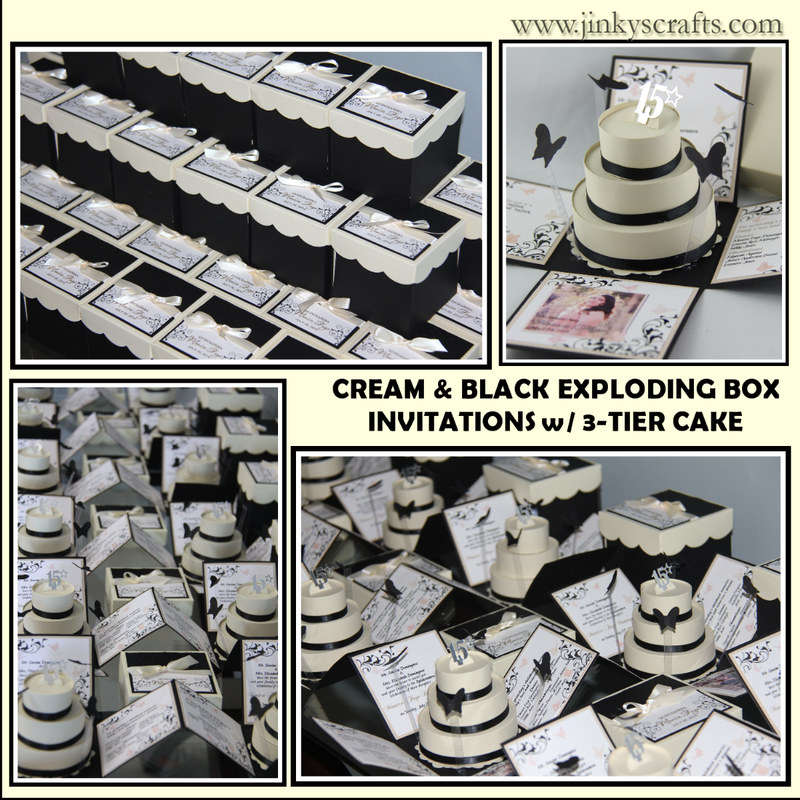 This Exploding Box Invitations with 3-Tier Cake will not fail you! Your guests will absolutely be so excited to attend your party after receiving this elegant and stylist Quinceanera invites. You can envision your own color combination + theme + design. We will help you create your FULL KIT and you do the assembly or we will help you with the Full Assembly. This depends on your set budget. Just let us know. These 3-Tier Cake can be embellished with rhinestones cake trimmings or glittered ribbons. We can bling your invites. The possibility is endless! The size of this Exploding Box Invitation is 3.5 x 3.5 inches cube. It can also be used as a Recordatorios or Gift Box Favor. 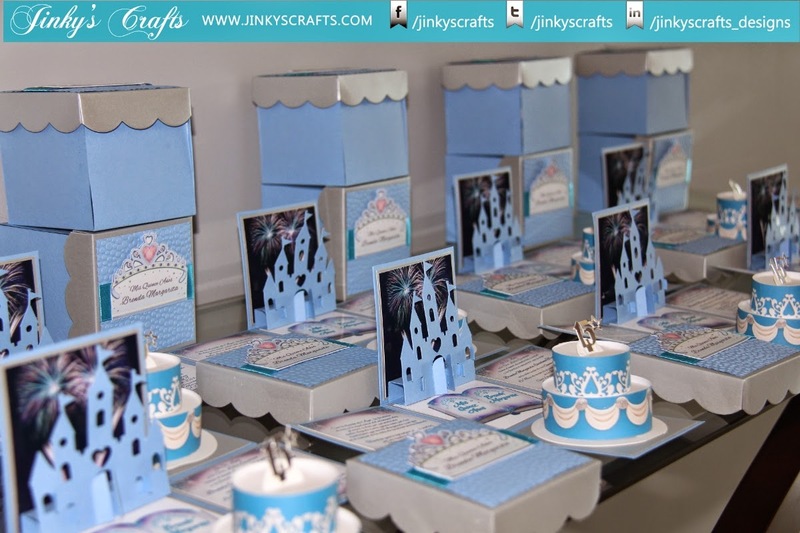 These can also be used as Quinceañera Invites, Bat Mitzvah or as Bridal Shower or Wedding Invitation. 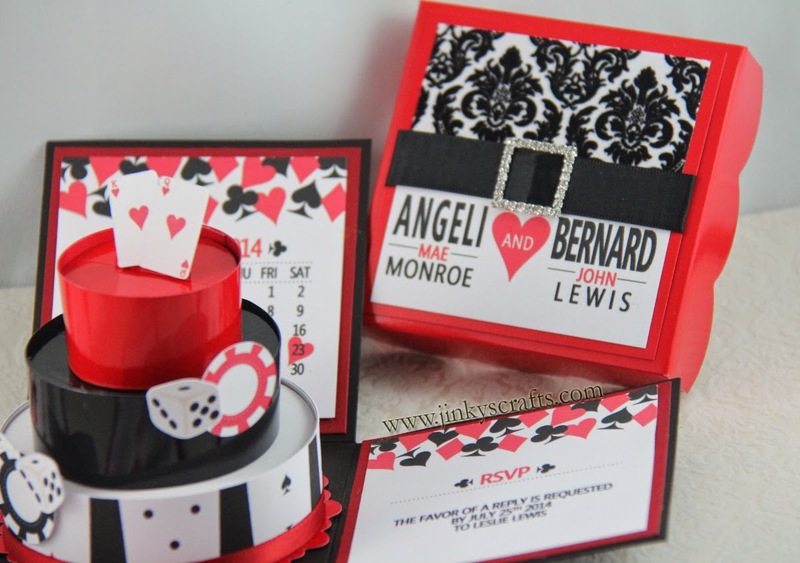 Are you a Modern Bride or DIY Bride looking for Las Vegas Themed Wedding Invitations Ideas? I want to share with you a modern and unique Las Vegas Themed Wedding Box Invitation. 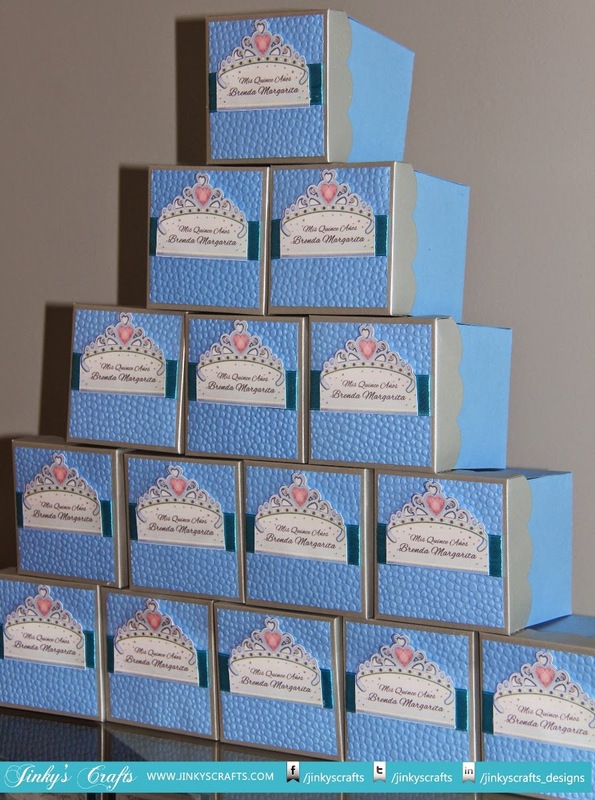 This Wedding Box Invitation is extra-ordinary and elegant Do-It-Yourself Couture. You have the option to create it yourself or order it fully assembled. 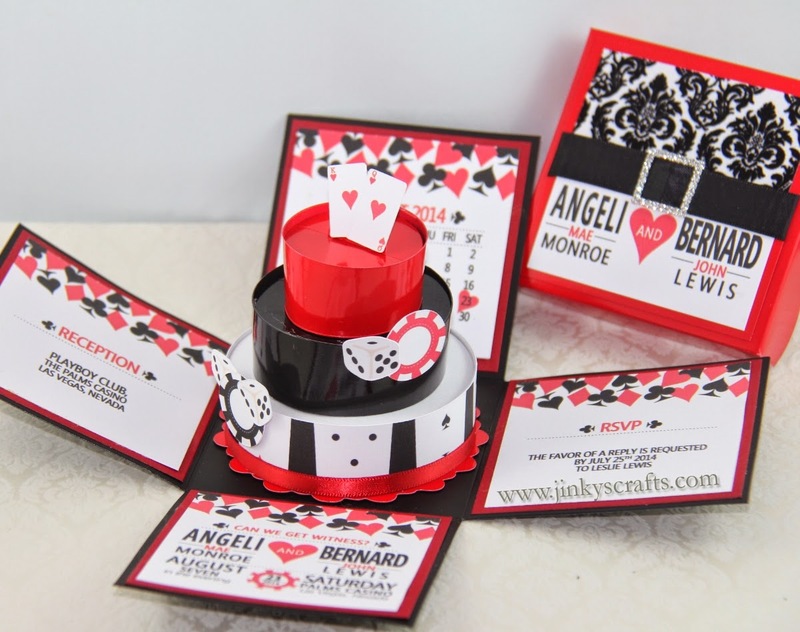 This Pop-Up Wedding Box Card explodes and reveals a Las Vegas Casino themed 3-Tier Cake once it is opened. This will surely make a big impression to your guests. There are 4 panels that you can be filled with Wedding Information like, Main Invitation Wordings, Church, Reception, RSVP information. You can put your Wedding Monogram, Wedding Calendar or Engagement Photo. It is super easy to customize. The cover can be decorated with textured flocked velvet designer paper to add extra dimension on your design. 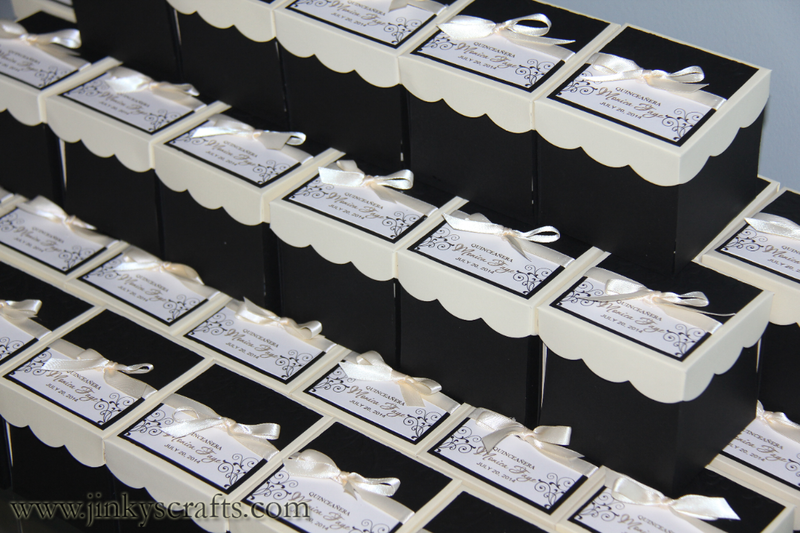 A satin ribbon with crystal/rhinestones ribbon slider will give a finish look and add elegance to your box.